Why Monday should be fixed upon as washing-day, is often questioned; but, like many other apparently arbitrary arrangements, its foundation is in common-sense. Tuesday has its advantages also, soon to be mentioned; but to any later period than Tuesday there are serious objections. All clothing is naturally changed on Sunday; and, if washed before dirt has had time to harden in the fiber of the cloth, the operation is much easier. The German custom, happily passing away, of washing only annually or semi-annually, is both disgusting, and destructive to health and clothes; the air of whatever room such accumulations are stored in being poisoned, while the clothes themselves are rubbed to pieces in the endeavor to get out the long-seated dirt. If Monday be the day, then, Saturday night may be chosen for filling the tubs, supposing the kitchen to be unfurnished with stationary tubs. Sunday night enough hot water can be added to make the whole just warm,--not hot. Now put in one tub all fine things,--collars and cuffs, shirts and fine underwear. Bed-linen may be added, or soaked in a separate tub; but table-linen must of course be kept apart. Last, let the coarsest and most soiled articles have another. Do not add soap, as if there is any stain it is likely to set it. If the water is hard, a little borax may be added. And see that the clothes are pressed down, and well covered with water. with cold water enough to cover them. To boil up once will be sufficient for fine clothes. Then take them out into a tub of clean cold water; rinse them in this, and then in a tub of water made very slightly blue with the indigo-bag or liquid indigo. From this water they must be wrung out very dry, and hung out, always out of doors if possible. A wringer is much better than wringing by hand, as the latter is more unequal, and also often twists off buttons. The lines must be perfectly clean. A galvanized-iron wire is best of all; as it never rusts, and needs only to be wiped off each week. If rope is used, never leave it exposed to weather, but bring it in after each washing. A dirty, weather-stained line will often ruin a nice garment. 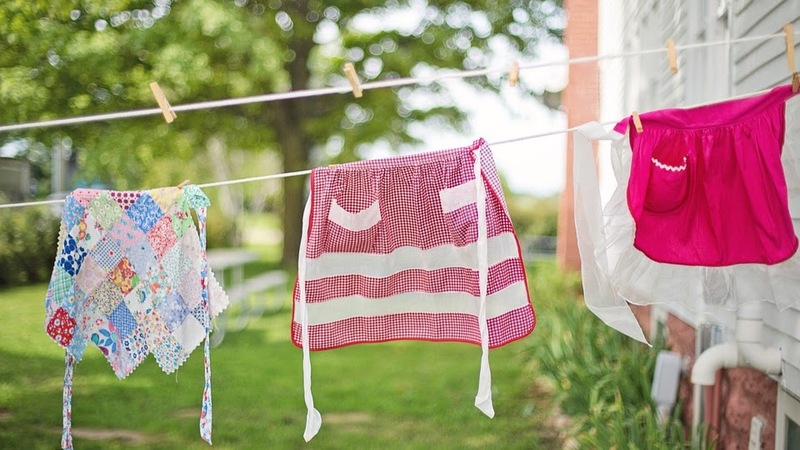 Leave clothes on the line till perfectly dry. If any fruit-stains are on napkins or table-cloths, lay the stained part over a bowl, and pour on boiling water till they disappear. Ink can be taken out if the spot is washed while fresh, in cold water, or milk and water; and a little salt will help in taking out wine-stains. Machine-oil must have a little lard or butter rubbed on the spot, which is then to be washed in warm suds. Never rub soap directly on any stain, as it sets it. For iron-rust, spread the garment in the sun, and cover the spot with salt; then squeeze on lemon-juice enough to wet it. This is much safer and quite as sure as the acids sold for this purpose. In bright sunshine the spot will disappear in a few hours. If delicate curtains, either lace or muslin, are to be washed, allow a tablespoonful of powdered borax to two gallons of warm water, and soap enough to make a strong suds. Soak the curtains in this all night. In the morning add more warm water, and press every part between the hands, without rubbing. Put them in fresh suds, and, if the water still looks dark after another washing, take still another. Boil and rinse as in directions given for other clothes. Starch with very thick hot starch, and dry, not by hanging out, and then ironing, but by putting a light common mattress in the sun, and pinning the curtain upon it, stretching carefully as you pin. One mattress holds two, which will dry in an hour or two. If there is no sun, lay a sheet on the floor of an unused room, and pin the curtains down upon it. In washing flannels, remember that it must be done in a sunny day, that they may dry as rapidly as possible. Put them into hot suds. Do not rub them on a washing-board, as this is one means of fulling and ruining them. Press and rub them in the hands, changing them soon to fresh hot suds. Rinse in a pail of clear hot water; wring very dry; shake, and hang at once in the sun. Flannels thus treated, no matter how delicate, retain their softness and smoothness, and do not shrink. Starch is the next consideration, and is made in two ways,--either raw or boiled. Boiled starch is made by adding cold water to raw starch in the proportion of one cup of water to three-quarters of a cup of starch, and then pouring on boiling water till it has thickened to a smooth mass, constantly stirring as you pour. A bit of butter is added by many excellent laundresses, the bit not to be larger than a filbert. Any thing starched with boiled starch must be dried and sprinkled before ironing, while with raw starch this is not necessary. them a small whisk-broom which is dipped as needed in water, it is better to let them lie ten or twelve hours. All clothes require this folding and dampening. Sheets and table-cloths should be held by two persons, shaken and "snapped," and then folded carefully, stretching the edges if necessary. Colored clothing must be rinsed before starching, and the starch should be thin and cool. THE EASIEST WAY IN HOUSEKEEPING AND COOKING. Aren't we happy to have automatic washers and dryers?? Wash beans, soak overnight and drain. Cover beans and all ingredients with cold water. Bring to boil, reduce heat and simmer until done. Taste test. May take 3 or more hours, according to the climate AND ALTITUDE.